As we look at the U.S. Presidential primary races and caucuses in late Feb. 2016, we see how themes from 2015 keep reiterating themselves: The voting public is guided in one direction by corporate media (to support establishment politics, keep the corporate-oligarchy dominant, and give the illusion of consensus). But the current planetary configurations indicate that the larger public is becoming more dissatisfied with the status quo, especially regarding financial inequality, and therefore more anti-establishment. They want a candidate who will fight for them and not for establishment politics, which has only widened the already historic inequality gap. This in turn challenges Big Media, which is invested in keeping the status quo and has moved towards the Right since becoming more and more consolidated, from 1983. Political royalty and establishment figures do not fare well in this environment. Jeb Bush’s campaign languished for many months before he finally called it quits on Feb. 20, 2016, despite having by far the largest amount of establishment funding (over $103.2 million as of mid-October 2015) and the big family name. Support for Democratic front-runner Hillary Clinton continues into late February 2016, though she never expected any serious threat for the nomination and certainly benefits from name recognition, especially among African American voters. But this may also account for her poor Favorability ratings with the general public. Currently Clinton has 53.6% Unfavorable and 40.0% Favorable (Huffpost Pollster, tracking 369 polls from 40 pollsters). Sanders has been steadily rising in Favorability, with 49.0% Favorable and 38.3% Unfavorable (Huffpost Pollster, tracking 97 polls from 17 pollsters). Donald Trump fares even worse than Clinton in these polls, with 57.6% Unfavorable and 36.1% Favorable (Huffpost Pollster, tracking 103 polls from 18 pollsters). According to various planetary factors, it is more likely that an anti-establishment candidate wins in Nov. 2016, and obviously Hillary Clinton does not fit that description. If she becomes the nominee for the Democratic Party, it becomes even more likely that an anti-establishment Republican will win in November. That would be either Donald Trump or Ted Cruz. But Clinton’s front-runner status for the Democratic nomination could change over the next few months, with tr. Mars in Scorpio for six months from Feb. 20, 2016 (where it is weak and troublesome with zero bindus in her 2nd house), and during the eclipse month of March 2016, which can create upsets. Though he has been showered with media attention since the start of his campaign in June 2015, Trump has had conflicts with the media, notably Fox News, and complains constantly about the media in general: “These are the most dishonest people, bad people,” Trump says. His avid supporters echo that disdain, and regarding his over-the-top rhetoric about Muslims, Mexicans, immigrants and anyone who crosses him – his supporters seem to love him for it, and not in spite of it. Now in late Feb. 2016, with his seemingly unstoppable march towards the GOP nomination, Trump promises to change the libel laws, saying “when The New York Times or The Washington Post writes a hit piece, we can sue them.” This could undermine the first amendment and the freedom of the press. The success of Sanders this far into the presidential campaign is because his focus on issues, like that of Trump (but from a different perspective) touches a raw nerve among so many Americans who not only know about but experience massive loss of jobs and inequality on so many levels, including enormous student debt. What goes under-reported is that despite his loss to Clinton in Nevada, Sanders is winning the Latino vote and the vote of those under age 45, especially the 18 to 30 yr. old group. Nevada has the 11th highest Latino voter population in the U.S. and is followed by primary races in 10 more states with a total of more than 6 million registered Latino voters. These all occur between March 1 and March 22. In March 2016 there are 26 major primaries and caucuses across the United States, starting March 1 – which is also Super Tuesday, when primaries or caucuses are held in a dozen or more states or territories. During March 2016 there are also two eclipses, and the month surrounding eclipses is bound to be more intense than other months, especially when there is a Total eclipse, and leading up to that eclipse. At the time of the Total Solar eclipse on March 8, 2016 there is a Shoola yoga, i.e. all planets in only three houses/signs. In Sanskrit Shoola means “thorn” or “spike” and in an individual’s chart life issues are increasingly intensified the fewer houses planets occupy, notably three or less. Adding to the drama is a near-Kala Sarpa yoga, with only Jupiter narrowly outside the perimeters of Rahu and Ketu. As Rahu and Ketu are snake-like, the Kala Sarpa yoga is said to be affected by “the serpent of time.” Needless to say, all these patterns add to the fated effects of the Total Solar eclipse, whose path goes over Indonesia and a large swath of the Pacific Ocean to the northeast of it, though not reaching the North American continent. The Total Solar eclipse on March 8, 2016 (24:50 Aquarius) is followed by the Annular Lunar eclipse March 23, 2016 (9:12 Virgo). Three days later is the last of the March primaries and caucuses, on March 26. Total eclipses are always more impactful, especially those that coincide with strong planetary configurations and events, as in this case, with the Jupiter-Saturn square (March 23 and May 26, 2016), involving tr. Mars and Saturn in Scorpio and tr. Jupiter and Rahu in Leo. On March 25, 2016 tr. Saturn turns Stationary Retrograde at 22:20 Scorpio. Also notable are eclipses that come close to the exact degree of prior powerful eclipses. We see this happening between the partial Solar eclipse from Sept. 13, 2015 (26:05 Leo) and the Total Solar eclipse March 8, 2016 (24:50 Aquarius). Hillary Clinton’s Moon (10th house lord) is at 29:40 Aquarius and is the nearest planet to any of the eclipse degrees. Her Moon is in Parivartana yoga with Saturn in Cancer, forming a Raja yoga. Among Republican candidates, front-runner Donald Trump has no major planets close to the eclipse degrees of 2015 or 2016, though natal Jupiter (R) is at 24:20 Virgo and the Total lunar eclipse of April 4, 2015 was at 20:19 Virgo. His Ascendant is at 6:55 Leo; thus, the closest eclipse is the one on Sept. 1, 2015 at 15:15 Leo, with a gap of 8:05 to his Ascendant. Ted Cruz has Class C birth data, so his Ascendant at 11:04 Virgo is not as reliable. If it were, his Ascendant would come close to the Lunar eclipse March 23, 2016 at 9:12 Virgo. 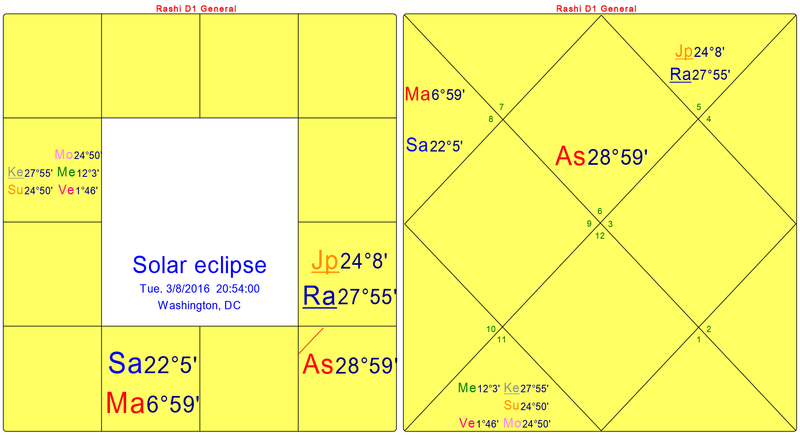 Marco Rubio has no natal planets on the eclipse axis for 2015 or 2016, though he has five planets impacted by tr. Saturn in Scorpio. (His data is Class X, i.e. time of day unknown.) 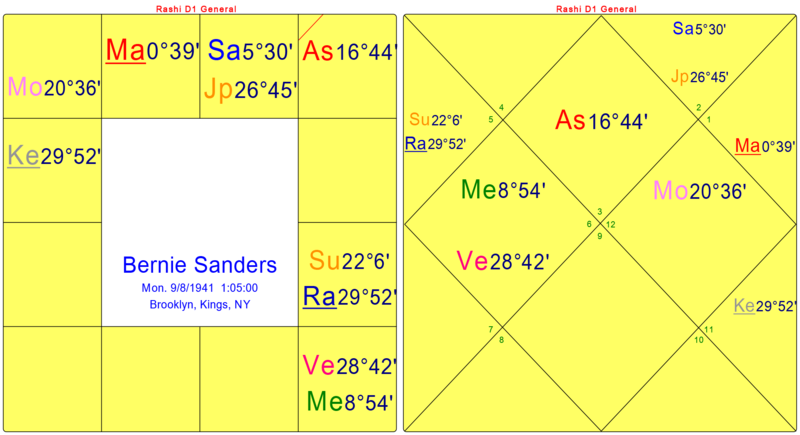 Donald Trump also has five planets on the Taurus-Scorpio-Leo axis, but none of them closer than 5 degrees to the Saturn SR degree, which is also the JU-SA square axis. I have said that Clinton could run into difficulties as early as Jan. 2016, and that is when polls showed a gradual slide downward for her, in spite of her formidable political machine and funding. As of early Jan. 2016 the Clinton campaign said their internal polls indicated they were leading rival Bernie Sanders by 25 points in the Nevada caucuses to be held Feb. 20, 2016. In the end, Clinton won by 5 points. One of the major factors in Nevada was the Latino vote, as mentioned earlier. Entrance polls showed that Sanders won the Latino vote in Nevada by 8 points: 53% to 45%. In 2008 Clinton the Latino vote by 64% to 26% over Obama. After Nevada, Sanders is just a few delegates behind Clinton, though she has an advantage to date in Superdelegates and she is expected to win South Carolina on Feb. 27, 2016. From that point onward, March should prove to be a very dramatic period, and one that will be fiercely fought by all candidates. Because March has two eclipses, along with the Saturn SR and JU-SA square (first of two), all of these affecting the Total Solar eclipse of March 8th, we can expect a wild ride through Super Tuesday and beyond, but especially leading up to March 8th. From March 1 to March 8, 2016 there are 27 of these Presidential primary events, if one includes every single event, such as Democrats Abroad and American Samoa, among others, though Super Tuesday on March 1st looms large, with the most number of primaries and caucuses on one day. The JU-SA square chart for May 26, 2016 indicates that Democrats keep the White House but that an insurgent candidate is more likely, as discussed in my previous article. Further, the March eclipses may favor Sanders, as discussed. Meridian, Bill, The Predictive Power of Eclipse Paths, 2010.